Ecotrust was created in 1991 by a small group of people from diverse backgrounds to foster the development of a conservation economy in the coastal temperate rain forest region of North America. Augmented the capacity to accomplish conservation-based development in a number of communities in the bioregion. We have supported residents in coastal communities in Alaska, British Columbia, Washington, and Oregon, and helped to build local non-profit and for-profit organizations that work on a wide variety of issues at the intersection of ecosystem restoration and economic opportunity. This work places us in the distinguished lineage of modern conservation. Over more than a century, conservationists have sought and secured protection for remnants of natural integrity against the forces of an incompatible economy. Conservationists have drawn lines, and often held the line, in an effort of which they (and we) are justifiably proud. But the effort begs the question, "How much is enough?" Ecotrust's answer is simple. One hundred percent is enough. An economy concerned with less will have to settle for less. It is time to turn our attention from the land to the economy, and create at last an economic system that will give natural systems their due. We are remodeling the Alhambra with a steam shovel, and we are proud of our yardage. We shall hardly relinquish the shovel, which after all has many good points, but we are in need of gentler and more objective criteria for its successful use. The challenge, Leopold foresaw, is not economy versus environment; we must have both to live. But at last it is becoming possible to define the "gentle and objective criteria" by which we can bring a new economy into being. The conservation economy sustains itself on income—"principled income"—earned from activities and practices that restore rather than deplete natural capital. The wealth of this economy is a reality of vital communities, flourishing diversity, and healthy landscapes and waterways, rather than an illusion sustained by instantaneous electronic transfers of funds. In early 1997, Ecotrust began to develop a strategic plan to broaden our influence in the bioregion over the next five years. We concluded that it would be more useful to follow nature's example and be clear about how we make decisions, rather than trying to predict where those decisions would lead. This document is the result. Here we describe six "operating principles" that guide Ecotrust and our bioregional affiliates as we create the institutions needed to envision, inform, and finance the conservation economy; support the civic entrepreneurs that can give it expression; and conserve and restore the landscapes and waterways needed to provide its benchmarks of health. Conceived by Ecotrust, these principles constitute a common current that flows among the organizations and capabilities we have created over seven years. They describe what we do, and explain what we leave to others. Through them we seek to turn our commitment to "principled income" from natural and social capital into actions for which we are prepared to be held accountable. when we have connected conservation to cultural and economic self-interest. There are several things we have chosen not to do. We have not sought to change government, to convene "stakeholders" or to achieve consensus. Such strategies do not, in our judgment, offer sufficient leverage over the forces that shape the relationship between humans and our environment. They address symptoms rather than causes. We have been too narrow in our understanding of local capacity-building. We have devoted most of our effort to build community non-profit organizations with local staff, boards, and resources addressing local issues in community ecosystems. New institutions like these are critical, but equally powerful results can be achieved through support to promising individual leaders or "civic entrepreneurs." We have underestimated the power of stories. We have tended to emphasize scientific data and failed to appreciate the power of local "myth," often leaving us insufficiently attuned to the informal communications ecology of communities and how information really flows to affect decision-making. We have not developed our own sustainable resource strategy. We are too dependent on philanthropy, have too little income-earning potential, and know far too little about the market for support to Ecotrust. We have asked others to do what we have not been sufficiently willing to do ourselves. We have not acted fully on our own conviction about the economic opportunity of a conservation economy. If we tell others that it is possible to make a good living in farming, forestry, fishing, tourism, and other sectors while preserving and restoring ecological integrity, we must be willing to invest there too. We must at times be doers, as well as catalysts and brokers. We are proud of our successes, but aware that even our best efforts run the risk of being quaint demonstration projects, ephemeral in the larger sweep of a changing world. We need to find the leverage points that make the strategic "tipping" of market forces possible, and help bring a new economy into being. We must support ourselves and feed our dreams. Income, ideally, exceeds expenses and allows saving. But to think of income solely in financial terms is to perpetuate the impoverishment of both communities and the environment. We have come to understand "income" as a series of flows nested as elegantly as Russian eggs: the favorable cash flow of a successful small business, the promise of a graduating class, the crop ripening on fertile soils, the maturation of a forest, the return of spawning fish, the recovery of an endangered species. Each of these, important in itself, enables renewal of a greater system. Each builds capital: natural capital, social capital, financial capital. In a conservation economy, individuals lead lives of sufficiency and eschew accumulation for its own sake. Businesses and organizations track and manage their uses of material and energy as closely as they monitor accounts receivable and payroll. Communities depend more on the stocks and flows of local landscapes and waterways, and less on the subsidized "surpluses" supplied through trade in an unregulated global economy. And societies sustain themselves within the energetic bounds of the sunlight that falls on the earth, rather than depleting the accumulated capital of fossil fuels and minerals and running down the productive capacities of their lands, waters, and air. A conservation economy will enable residents of the coastal rain forest bioregion to harvest a steady stream of economic wealth from their understanding of the natural ecology of the region while simultaneously conserving and restoring natural and social capital. The development of a conservation economy is a deeply "conservative" strategy. Just as a responsible businessperson will seek to grow his or her asset base and live off current income instead of debt, conservation economics seeks to preserve and grow the natural capital that is the ultimate source of our health and wealth, to live off income instead of "eating our seed corn, " and to build as much new wealth as possible on increasing knowledge. We envision a growing web of individuals, businesses, organizations, and institutions in which the residents' love, knowledge, and stewardship of a place axe manifest in their livelihoods. We envision a region in which cities and the surrounding countryside support one another in a mutually beneficial relationship. The energies that will build this economy are those of pragmatic self-interest, entrepreneurial opportunity and optimism. The blue Pacific and deep green forest belt from San Francisco to Anchorage remain relatively clean, diverse, and productive with growing and prospering big cities and small towns. Wealth is already being added here with significantly less ecological damage as the region makes the transition from a natural-resource-based economy to a knowledge-based economy. The barriers to realizing a dream of lasting prosperity and environmental well-being in the rain forests of home are not technical, scientific, financial, or political. The challenge instead has everything to do with attitudes and culture—the ways in which we and other residents interpret self-interest, and our capacity to imagine where the opportunities lie. Nature self-manages materials and energy with an elegance and intricacy we cannot match. There is no need to "manage" natural systems. We must learn to manage ourselves and our relationship with the environment. For ideas about how to do this, we start by observing the patterns of nature—the fundamental evolutionary processes that govern all life-because this 3.8-billion-record is the largest and longest-surviving body of evidence available. We seek to stimulate the development of systems that organize and regulate themselves as effectively as those found in nature, and to minimize the command-and-control, hierarchical authority-driven mechanisms that tend to characterize human designs. Because they are more effective, more economical, more enduring, and infinitely faster to replicate, we seek to maximize the characteristics of self-organizing systems in our own institutional designs, our capacity-building work in communities, and our own behavior as entrepreneurs in the regional economy. Self-organizing systems—whether salt marsh, school, or small business—live in a state of dynamic equilibrium: stable enough to conserve and process information, but flexible enough to evolve and change. The agents within such systems are autonomous, but knit by loose connections. Decisions, made independently, tend to be guided by simple rules. Decisionmakers network with others, and practice innovation. Rigorous feedback makes learning possible, and an elegant pattern emerges. Our operating principles seek to honor these attributes as we seek to stimulate the development of a conservation economy in the coastal temperate rain forests of North America. Environment. Does this decision treat natural capital responsibly? Does it preserve or restore environmental conditions (including other species, land, water, and air) rather than wasting or degrading them? Economics. Is this decision ion prudent with respect to financial capital? Is it cost effective? Does it create wealth and reduce waste? Equity. Does this decision build social capital? Is this decision fair to all parties, or does it sacrifice some for the selfish advantage of others? Our geography is vast and our resources are limited; we must focus our time and effort. We define "home" as the two-thousand-mile north-south extent of marine systems, estuaries, and forest watersheds from Kodiak Island, Alaska to the coastal redwoods of California. We include the region's urban centers-San Francisco, Portland, Seattle, Vancouver, Victoria, and Juneau because through markets, jobs, and capital they shape the coast as much as they in turn are shaped by the broader region. People and forests have co-evolved together here over a relatively recent ten to fifteen thousand years, and the inhabitants from aboriginal time to the present have prospered because of the natural abundance of the land and adjacent sea and the pioneering spirit of the people who moved here from elsewhere. The region possesses integrity as a whole, but also great diversity across a spectrum of cultural, ecological, and socioeconomic conditions. We focus our work in "community ecosystems" defined by the intersection of natural ecological units (such as watersheds) with patterns of human settlement and commerce. To us, these provide more reasonable units of interaction than traditional political boundaries. The community ecosystems in which we work vary in size from the thirty-million-acre Copper River and Prince William Sound ecosystem of Alaska to a hundred-acre urban neighborhood in Northwest Portland, and range in population from a few hundred to some fifty thousand people. We devote substantial energies to understanding the social, economic, and ecological characteristics of these "wholes within wholes." If we ask, "Who is our customer?" the clearest answer is an individual, a public or private civic entrepreneur, the promising leader who sees opportunity in the conservation economy. We seek to help these individuals nurture their entrepreneurial personalities, provide credible, collaborative leadership, work in teams, and bring their unique contributions to the playing field. Some individuals we support are businesspeople, the classic entrepreneurs. We support these people with technical assistance, marketing and business services, and commercial and non-commercial credit and equity resources. Others may be religious leaders, local government officials, tribal leaders, students, or those trying to build any of a great array of community and environmental organizations. Civic entrepreneurs are the key element of the transition to a conservation economy. We support these individuals with internships, fellowships, networking, and a variety of community organizing, mentoring, and organization-building experiences. We also provide assistance with technology, analytical tools, communications services, and fundraising guidance. Often what civic entrepreneurs need most is the sense that they are on to something significant and that a growing community of people shares their passion. Such individuals rarely need training; promising leaders already have the integrity, the intelligence, the creativity, and the motivation that quickly leads them to success if given half a chance. We offer them tools to do their work more quickly and more effectively. Interesting and unpredictable things happen when civic entrepreneurs are linked in webs and networks—connected closely enough to have the opportunity to interact with others, but not so tightly that their freedom is constrained. In nature, these connections are reflected in the infinitely complex interactions of species, climate, and food sources that constitute an ecology. In human systems we add to this complexity the connections that arise from culture, belief, ideas, and social infrastructure—in short, the staff we use to create communities of all kinds. Such connections permit cooperation and competition, but not control. As independent scholar Jane Jacobs has said: "We need all kinds of diversity, intricately mingled in mutual support." This is the way evolution and economic development both work—what Jacobs describes as "differentiation emerging out of generality." We seek to foster diversity, complexity, and connectedness the rich soup from which interesting and novel solutions emerge. We seek to create connections in the bioregion that might not otherwise occur. Thus we link local practitioners with practitioners from other communities; we facilitate dialogue between individuals and organizations within specific communities; we connect rural producers to urban markets; we connect entrepreneurs to marketing expertise and money, we connect communities with sources of scientific expertise; and we link citizens with information, and local organizations with regional and national sources of financing. The fabric of these connections—the real and enduring structure in the network—is a common commitment to environment, economics, and equity. This shared commitment to simple rules will allow uncontrolled and undirected interactions to produce a deep underlying coherence that provides structure, continuity, and identity to the movement towards a conservation economy. At some point, the combined efforts of all committed to new means for creating health and wealth will reach a critical threshold—the "tipping point"—beyond which a conservation economy will become the norm, not the exception. Innovation—vigorous experimentation with tight feedback loops—is the key to adaptation and qualitative growth. Businesses, organizations, governments, communities, and cities innovate or fail. It is not a question of whether the world changes, but of whether we will change with it, or, better yet, stay just a little ahead of the curve of change. Feedback loops draw the distinction between successful and unsuccessful experimentation. In nature, the test is simple: Are your genes passed on to the next generation? If we are to model natural systems in human affairs, our feedback loops need to be equally explicit and carefully designed. The quantity, quality, and timing of information feedback are all important. Too much, too poor, or too late are equally deadly. We have chosen to dedicate a substantial share of our resources toward defining specific feedback loops that indicate improvements in environment, economics, and equity. We call these "scaleable indicators" that measure social, economic, and ecological changes over time at the bioregional, community and individual enterprise level. All of our work—leadership development, networking, business, and community-building initiatives—will have to be measured against similar criteria of improving environmental conditions, increasing equity, and earning competitive financial returns: e3. Civic entrepreneurs will pay closer attention to what we do than to what we say. To find strategic leverage points—small disturbances that can amplify rapidly to large waves of change—we must ourselves be enmeshed in the building of the conservation economy. We must do what we want to see on a larger scale. This means we have to practice what we preach: be civic entrepreneurs in the communities where we live, as well as helping residents in other communities; run conservation-based businesses, as well as supporting other entrepreneurs; and model a conservation ethic in the way we run our own organizations, including the design of our offices, our modes of transportation, and the ways we plan and carry out our work. The uniqueness of the Ecotrust "family" of organizations is our focus on the development of a conservation economy in the bioregion. No other organization coherently marries environmental, economic, and social goals with a concrete agenda for action. We need to play to this strength, and emphasize the uniqueness of our focus. Understanding, conservation, economic development, and policy—the cardinal points on Ecotrust's compass—need to be viewed as means toward a conservation economy, and not ends themselves. As we have expanded, we have tended to develop new organizations (e.g., Ecotrust Canada, Interrain Pacific, Shorebank Pacific) to evolve different aspects of our work. Now that these are established entities and capacities, we must integrate their work more effectively at both the organizational and the community levels, and begin to simplify the sometimes bewildering array of new institutions. Strengthening our partnerships to improve the delivery of tools and resources is a critical challenge which has important implications for how we organize and manage ourselves. The seven years since Ecotrust's founding have been characterized by a wide range of organization-building activities in relatively few communities. It is now time to get more strategic about how we identify and support civic entrepreneurs and why, when, and how we follow on with additional capacity-building investments in a particular community. We can do this by better articulating our theory of change, defining our tools, clarifying our relationships with entrepreneurs, and carefully identifying opportunities for impact. Most of our work to date has focused on rural communities, but the fate of rural places depends on the nature of their connections to larger cities. The traditional resource-based economy of the coast is being eclipsed by a new economy emerging in the cities. Market connections are particularly important; urban markets can augment demand for environmentally responsible goods and services produced in rural communities. We intend to expand our work to additional communities in the bioregion, including the redwood coast of Northern California and urban communities such as Northwest Portland. We will nourish the growing network of civic entrepreneurs in both the country and the city throughout the bioregion as they lead the way to the conservation economy. We must model what conservation economics looks like when it works. We need to engage directly in the forestry, fishing, farming, real estate development, and tourism sectors, and demonstrate that it is possible to earn principled income by investing in, rather than depreciating, natural capital. We devote a significant amount of time and effort to raising funds. This distracts from our ability to innovate in the bioregion and fundamentally fails to model "sustainable" behavior. We intend to diversify our base of support and achieve financial self-sufficiency so that we can truly control our destiny. A track record of successful conservation-based investments will help point the way. 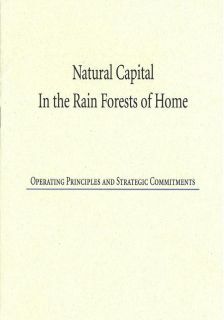 Natural Capital in the Rain Forests of Home was written by Spencer B. Beebe with substantial assistance and inspiration from John Cleveland, Gary Miranda, and Edward Wolf. It is based on conversations over the course of more than a year with Ecotrust colleagues, members of the board and staff of all our affiliated organizations, and participants in a strategic planning trip on the Middle Fork of the Salmon River in July 1997. Special thanks to John Cleveland (On Purpose Associates), Kristina Kiehl, Richard Manning, Alana Probst, Allan Savory, and Ecotrust board members Robert Friedman, Mary Houghton, Jane Jacobs, Dylan Simonds, and Jean Vollum.